Jontay carries cotton webbing in both regular weight (7L) and heavy weight (6L for 1-/2" and 2", 3L for 1"). Cotton webbing is a multi-purpose narrow fabric webbing used in applications such as handbags, totes, belts, and straps. Regular-weight cotton webbing is about 1/16" thick in the 1", 1-1/2", and 2" widths. 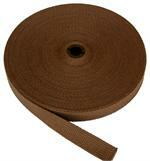 Heavy-weight cotton webbing runs about 3/32" thick on the 1-1/4", 1-1/2" and 2" widths. The 1"-width heavy-weight (3L) is closer to 1/8" thickness.